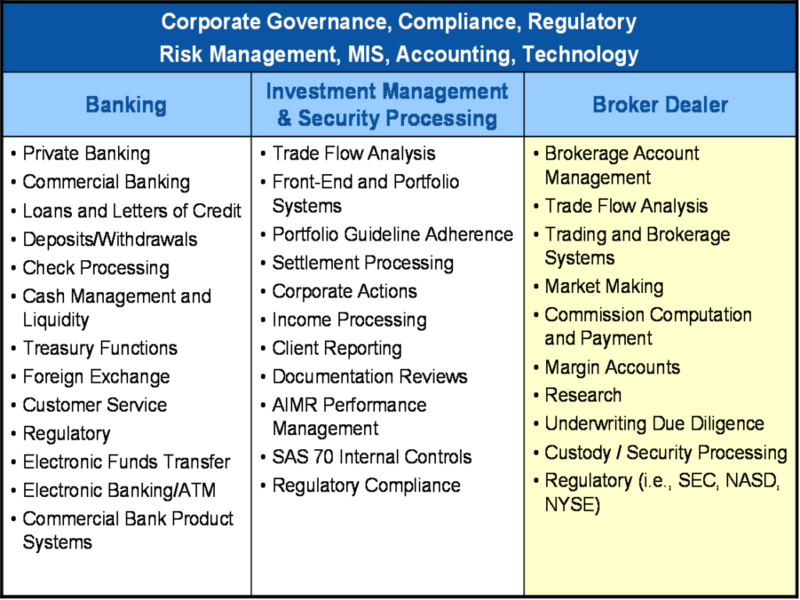 Trading Compliance - eDelta Consulting, Inc.
eDelta’s practice serves multiple sectors of the industry, including, but not limited to, Banking, Investment Management/Securities Processing and Broker Dealer. Financial, Operational and Technology Policies and Procedures Development. Compliance Program Development, Management and Execution. Internal Audit Outsourcing and/or Assistance (including Sarbanes Oxley). Business Continuity Planning and Disaster Recovery. Like many other financial entities, broker-dealers are facing increased scrutiny and accountability from a variety of sources. These firms must comply with a myriad of statutes, rules and regulations promulgated and administered by the SEC, the NASD, the NYSE and SIPC. It is now more important than ever to develop reliable and repeatable processes for managing compliance requirements and an overall framework for controlling corporate risk. Anti-Fraud Provisions (Fair Dealing, Best Execution, Confirmation Rule, Short Sales Insider Trading, etc.). NASD requirements, including 3010, 3012 and 3013. Financial Responsibility Rules (Net Capital Rule, Customer Protection, Books and Records, Risk Assessment). Anti-Money Laundering (See AML Offering). Chief Compliance Officers/Compliance Rules (Rule 206(4)-7 under the Advisers Act and Rule 38a-1 under the Investment Company Act). NASD /NYSE Rules and Regulations.